I asked my Facebook followers which socks they liked the most. These red cable slippers got the most votes, and these were the next in line! I got a lot of people asking me if I would still make a video of these, so I did! 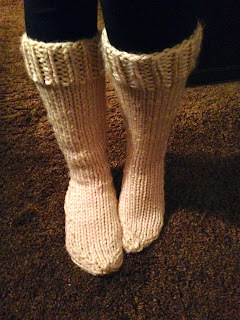 They are easy enough for a beginner to make, and it knits so fast! So hurry and go make yours!!! But the pattern calls for Lion Brand wool-ease thick & quick which has 20% wool in it to make it extra warm and cozy. I know I know, I have big feet! Size US 13 DPNs or circular needles while using the magic loop method. I looove seeing what you guys make, PLEEASE post a pic on Instagram or my Facebook wall so I can see what you made! That's my favorite part about making these videos for you. 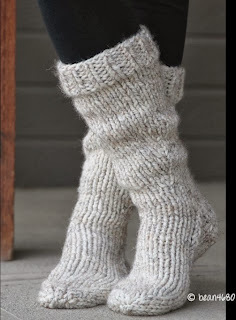 Hi there, I love these socks but can these be done using a circular needle or do they need to be DPN's?